Here are a couple sets of marble magnets that I made to coordinate with two of the magnetic boards I made and posted yesterday. They're very easy to make. C'mon, I'll show you how. 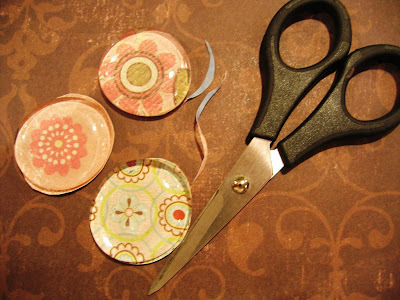 You will need: scrapbooking paper scraps (or small pictures), glass marble rocks with one flat side (you can usually find these in the floral section of your craft store) scissors, pencil, Craft Bond Glue (see picture below), Modge Podge, 3/4" magnets, and a loaded hot glue gun. 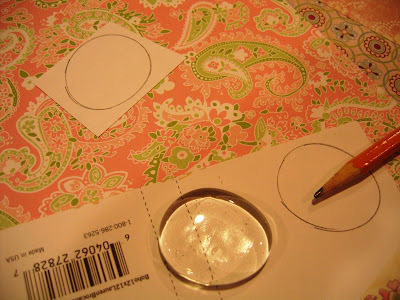 To start, trace the marbles onto the back of your scrapbook paper and cut out. Here I have all my paper cut out and I'm getting ready to adhere the paper to the marbles. 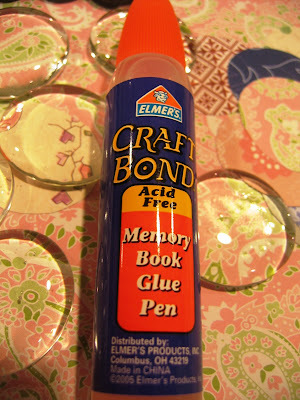 This is the glue I used. The nice thing about this glue is that it has two tips, a wide tip and a fine tip, for dispensing glue. Put some glue on the bottom of your marble. 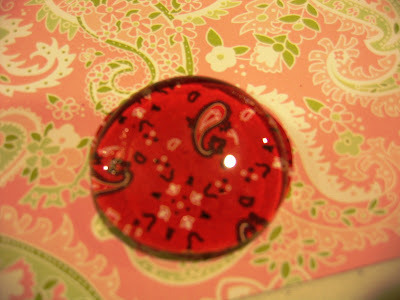 Stick the paper down on it, printed side down so that it will show through the rounded side of the marble. Then smoosh the marble down to get the air bubbles out. 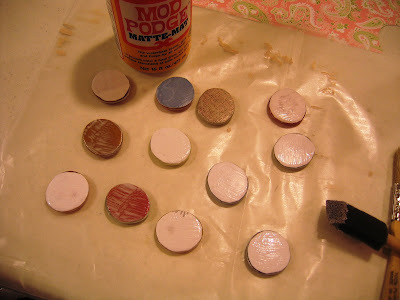 Then let them sit overnight so the glue is completely dry. The next day, trim the overhanging edges of paper. 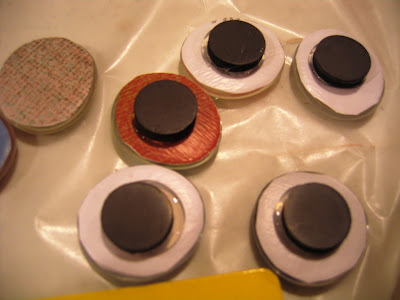 Next, flip the marbles over and brush Modge Podge around the edges and over the entire bottom of the marble. Repeat a couple hours later. These are the magnets I use. Don't try to use the type of magnet that comes on a roll. That stuff is weak. You need good strong magnets to hold up the weight of the marbles, and these magnets do the trick. 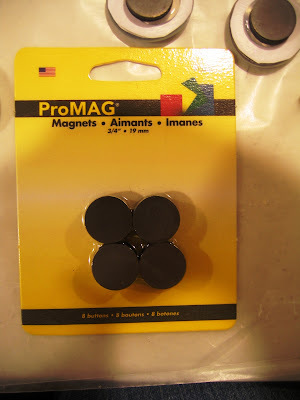 Put some hot glue onto the bottom of the magnet and squoosh the magnet right into it. 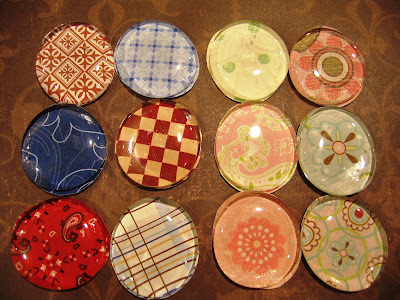 Let the glue dry and then you'll have nice marble magnets! Look at you crafty Martha!! Hee, hee, hee. Seriously, those look really great! By the way, I tageed you. Check it out! The finishing touch to that adorable magnet board!! Thanks so much!! Great tutorial, a lot of pictures and all very very helpful! I've been wanting to make these forever! 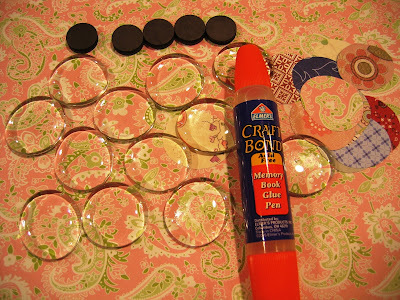 Thanks for the great tutorial, and and fyi, I actually found these marbles at the dollar tree the other day! SCORE! SERIOUSLY??!! UGH...I had a ton of these marbles...was trying the "marble in a jar" thing with the kids...and it just never worked out. 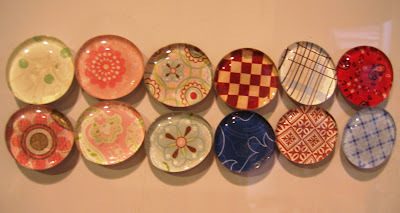 I tried "decoratively" putting them in a jar...and ended up throwing all of them away because I was sick of the things always getting all over the house...!! Now what do I want to do?? GO GET MORE...!! I like that you can't see the glue through the marbles too! 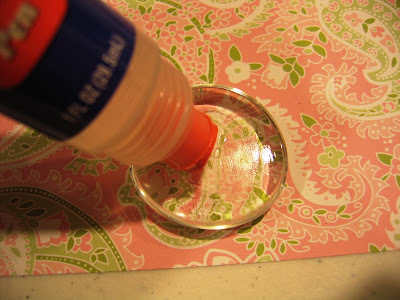 I have seen people do these, and you see a big glue blob where they stuck the paper...wasn't a huge fan..!! SIGH...gotta try this one for sure!